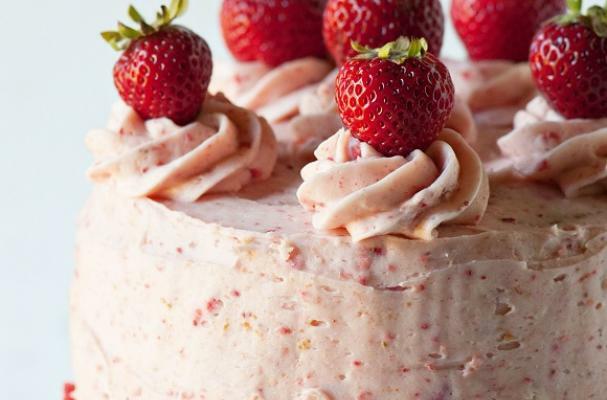 This strawberry shortcake layer cake from Culinary Concoctions by Peabody is simply stunning. This pretty pink dessert commands attention even though it does not have any of the traditional bells and whistles of a traditional layered cake - the beauty is in its simplicity. A really good white cake (made with good quality butter and pure vanilla extract) is frosted with a homemade strawberry buttercream. The key to the buttercream is using freeze dried strawberries so that you get all the flavor with out the added moisture. If you only make one dessert this strawberry season, make sure it is this cake.